Sometimes you just have to try a place for yourself and not rely on reviews. This past Sunday Chris and I found ourselves enjoying probably the best breakfast/brunch that we have had since moving to Brevard just about a year ago. Quite honestly it was a bit of a fluke. We were headed to a mid afternoon concert at the Brevard Music Center and had planned to do a few stops on the way into town including getting brunch. We have driven past The Inn at Brevard hundreds of times since moving but had never quite figured out when they served meals to the public. This day a sign placed conveniently on the sidewalk in front let us know that we were right on time to enjoy brunch so we pulled in and headed into the historic inn instead of going into town to another restaurant. I had read several less than glowing reviews in various places about the quality of the food at this place so I was not sure what we would find but quite honestly we were both thrilled with our meals. Sometimes you just have to try a place yourself and not rely on reviews. I imagine some of the reviews I read were justified but on the day we visited service and food were top notch. The Inn at Brevard was built in 1885 and was the private home of Mrs. Woodbridge who was a widow from Virginia. She entertained a great deal in the lavish home and around 1940 the Inn was sold and became The Colonial Inn for several years. The Inn is on the National Register of Historic Places and is currently owned by Howard and Faye Yager of Atlanta who have a great deal of their massive art collection on display throughout the beautiful colonial home. We were not there to book a room but instead for brunch and when we arrived it appeared that we were the only ones there other than the gentleman (Brett, I think) who served behind the desk and who also served as our waiter. He graciously set a table for us outside as we wanted to sit on the front porch and was friendly and offered us a bit of the history of the place. The food—oh the food. The pictures will show you a bit but it can not capture the tastes. You will have to imagine those on your own. 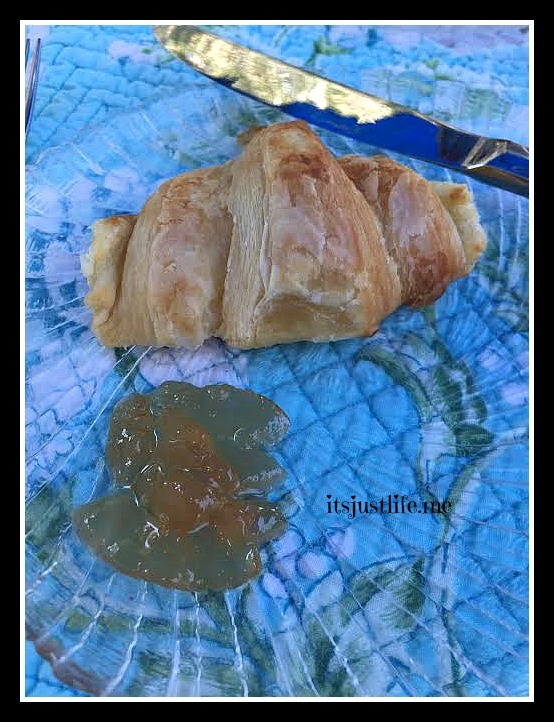 Freshly made croissants served with pear jelly made from the fruit of a pear tree on site was gobbled up quickly. Chris chose the Crabcake Eggs Benedict and raved about the flavors. 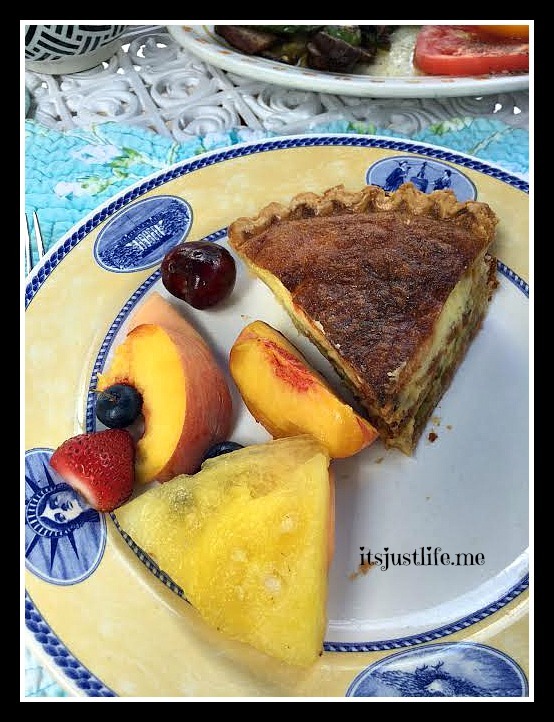 I chose the Quiche selection and was thrilled to find that not only did my quiche come with a generous side of fresh fruit but we also had a bowl of grits and some amazing vegetables to share as well. I love how the serving dishes are all different –no matchy matchy here and it works perfectly to showcase the food. 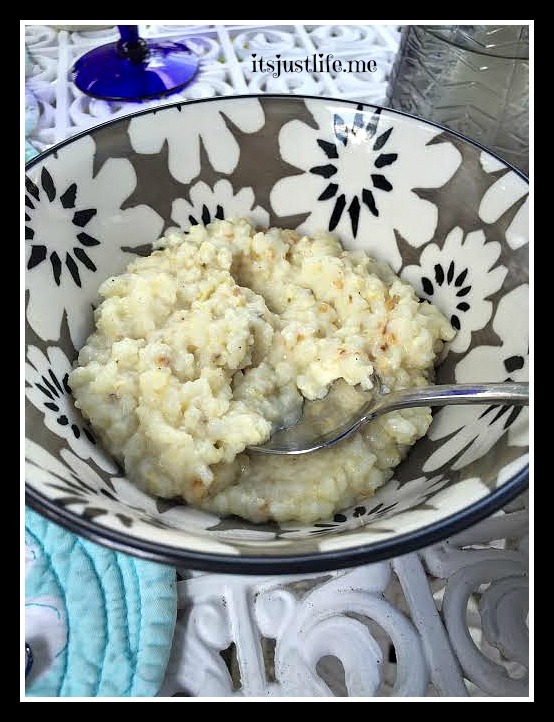 I have become a bit of a connoisseur of grits these days and our waiter told me that these chunkier grits were Yelton grits which I have since purchased a big bag of at Ingles. Guess what we will be having this weekend? 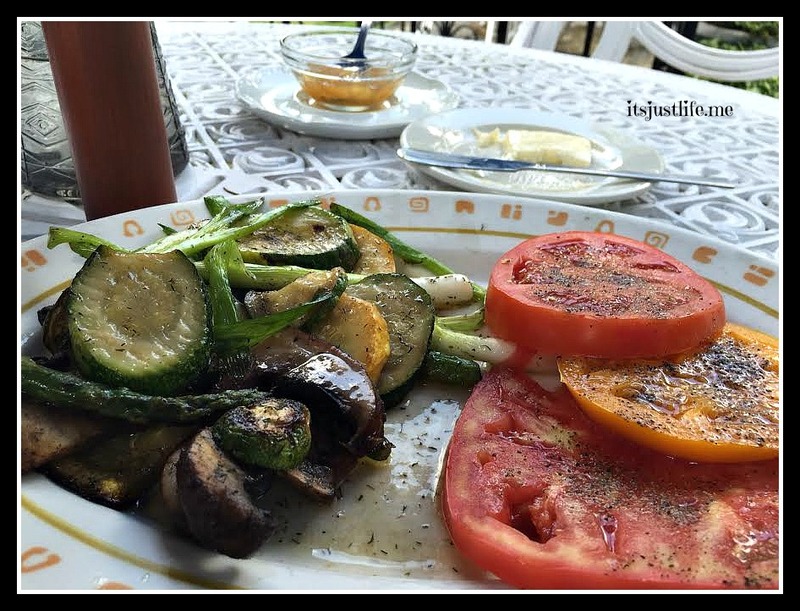 The vegetables included fat slices of heirloom tomatoes peppered to perfection and an interesting blend of sautéed squash, asparagus, spring onions and mushrooms. It topped the meal off perfectly. 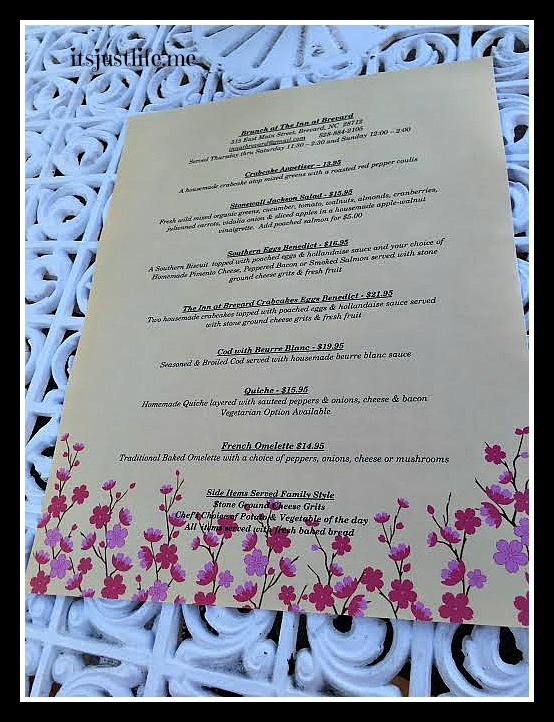 Our meal was leisurely and so enjoyable and even if we were the only ones there that day we felt like we had found a little slice of heaven in The Inn at Brevard. 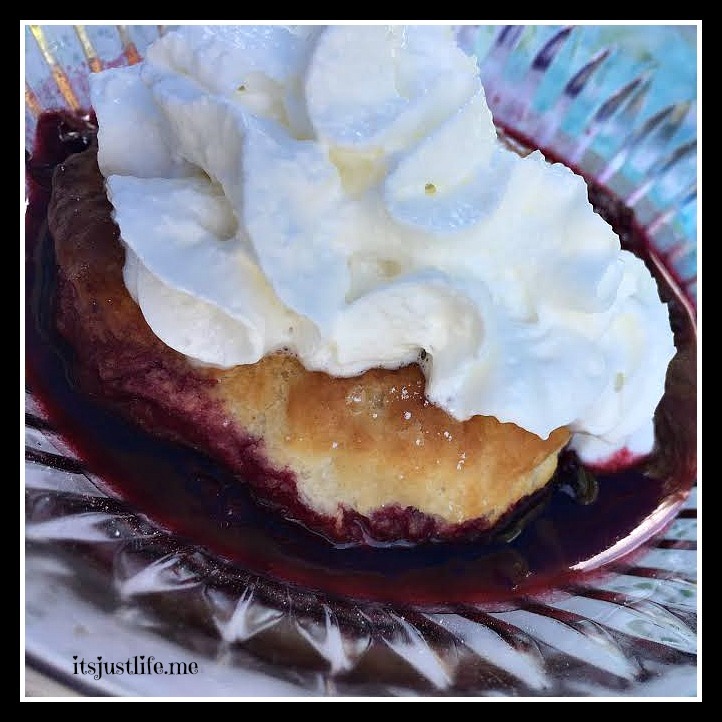 Of course we opted to share a dessert and were pleasantly surprised when we were served with our own Berry Cobblers (they just cut the flakey biscuit in half) . If you are ever in the area I would recommend stopping at The Inn at Brevard. They currently serve brunch from 11:30-2:30 Thursday through Sunday. While their main focus is their guests who book accommodations the public is also welcome for breakfast daily during a limited time so make sure you call to check ahead of time to check on serving times. I am definitely going back to take a look at the artwork and the Inn itself so you can expect to see a post on that at a later date. To read more about The Inn and all that it offers make sure you check out their website here. Looks like you found a gem! A couple of my favorite restaurants have mixed online reviews – as you know, they are not always right. The meal looks so fresh. It was so fresh and tasty. I think sometimes you just have to experience things for yourself. I am usually pretty forgiving and give a place a couple tries before I make a decision about service and food. This place won me over right away. It’s interesting to read about the food you ate. Our choices are so limited in a smaller community like Faribault. However, a new restaurant is opening soon in an historic building and I am excited about the possibilities. They are promising more than the standard fare for these parts. I’ve never eaten grits. I believe they may be an acquired taste for someone from Minnesota. Oh my goodness—-you have NEVER eaten grits??? I don’t know how you have lived this long and never had grits! 🙂 There are so many varieties to choose from and every place makes them just a little bit differently. But I am a huge fan. As you can tell. Your new restaurant sounds promising. Hopefully it will make a go of it. Brevard is a small town of only around 8,000 but it has an amazing selection of both things to do and restaurants mainly because of the huge tourist industry. We are really impressed with everything it has to offer for a small town. Grits have become one of our dinner-time favorites! Never had it before moving here! There is nothing like a well prepared bowl of grits. Got some of those lovelies to make for Saturday brekkie! What a fantastically lovely place you have found! I love that Chris’ lemon has a little hat to keep the seeds in! The tomatoes look scrumptious and that dessert…divine! What a delicious trip! He commented on that very thing but he called it something a little cruder than a hat. 🙂 It was delicious. No doubt about it. This is my kind of place. 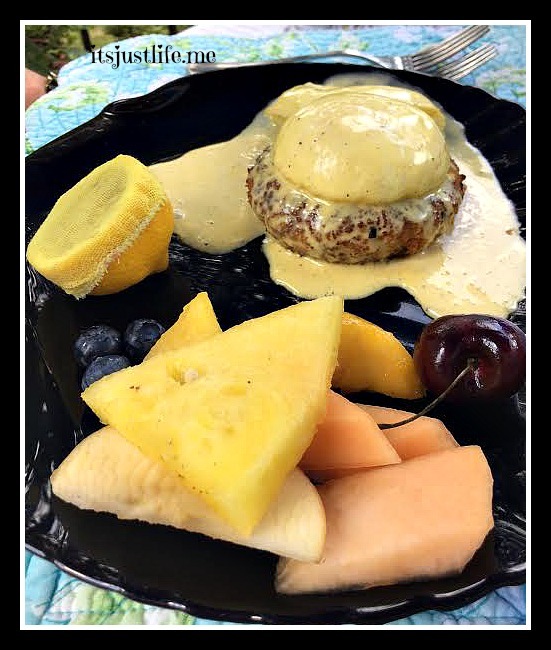 The Crabcake Eggs Benedict looks so good and I love that you got grits and some wonderful veges with your quiche! Everything looks so fresh. It is also nice to get all that individual attention when you are the only ones there.